When I started planning this trip lots of people asked me why would I want to go there and where are these places. Well, if you haven't been to any of these countries you are missing out and they are well worth a visit. The only problem is logistically although they are next door to each other there is a problem crossing direct from Azerbaijan/Armenia and vice versa so you have to travel from Georgia. We flew from Bahrain direct to Baku in Azerbaijan. 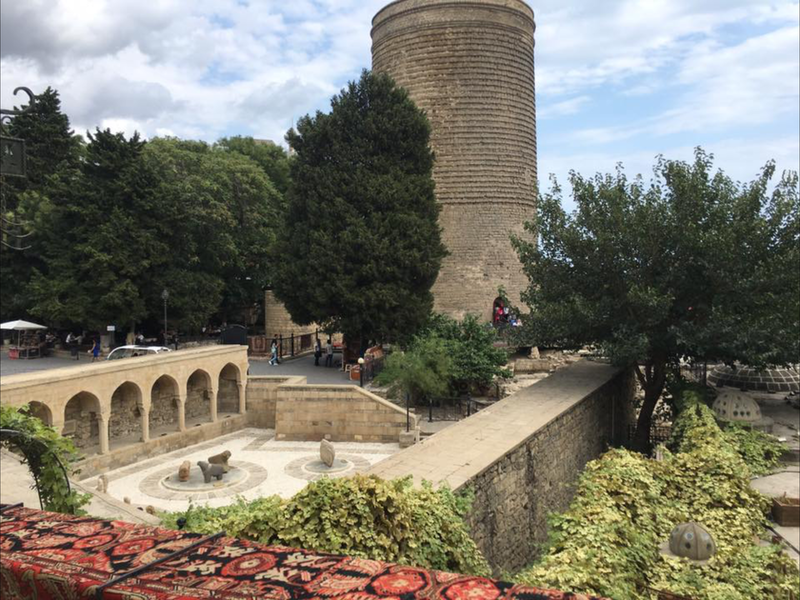 I loved Baku, we stayed in the historical area in the Sultan Boutique Hotel which is steps away from Maiden Tower and all the Old Town restaurants and shops. 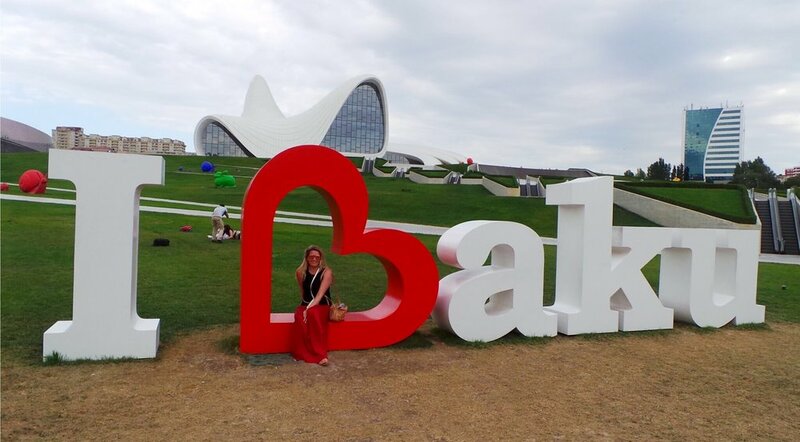 Baku is a great place to walk, they have a nice promenade, public parks and shopping areas where you can wander and sit outside and watch the world go by. It almost seemed European as lots of people have toy dogs which they take everywhere and it seems that sitting outside a coffee shop and people watching is a favourite thing to do here. We visited the mud volcanos which are unusual in that cold mud rather than lava is coming up from the ground. The highlight of this day was our game guide letting my friend drive the 1984 Lada up to the mud flats on fairly tough terrain. So much fun! Recommend doing this as it is just so unusual and interesting and I am not sure where else in the world you would find these mud volcanos. We also spent a day walking around the historical center which includes the Maiden Tower and the Sultans Palace and then up to the Flame Towers which has great views over the city. 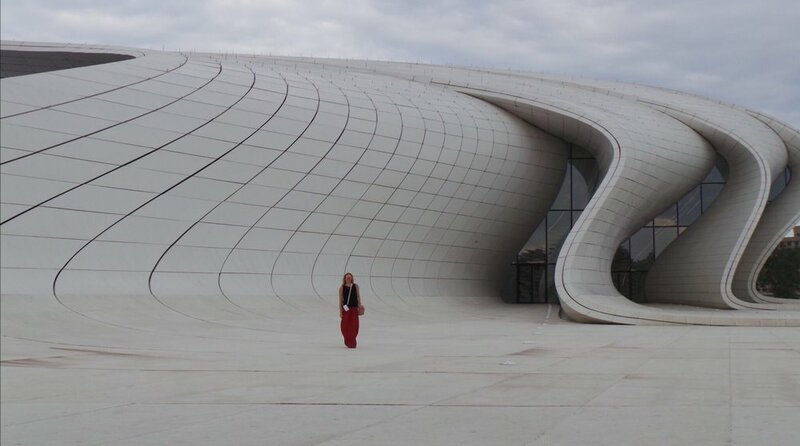 On our last day in Baku we visited the Heydar Aliyev Center which is a wonderful modern building designed by Zaha Hadid. The building and surrounding area is great for walking around, seems to be a favourite for people getting married and taking pictures, saw two brides during our afternoon there. There is also a nice modern cafÃ©/bar there so when you have finished wandering you can take a break with a view. I was impressed with Baku, it is a new city and clean with plenty of parks and has been designed for people to be able to enjoy being outside. From Azerbaijan we flew to Tbilisi, Georgia. Stayed in the Old Town to begin with which was great for strolling around and looking at all the old buildings and churches and there are plenty of bars and restaurants to visit. I found the old houses fascinating, lots of them are almost derelict with faded painted walls. 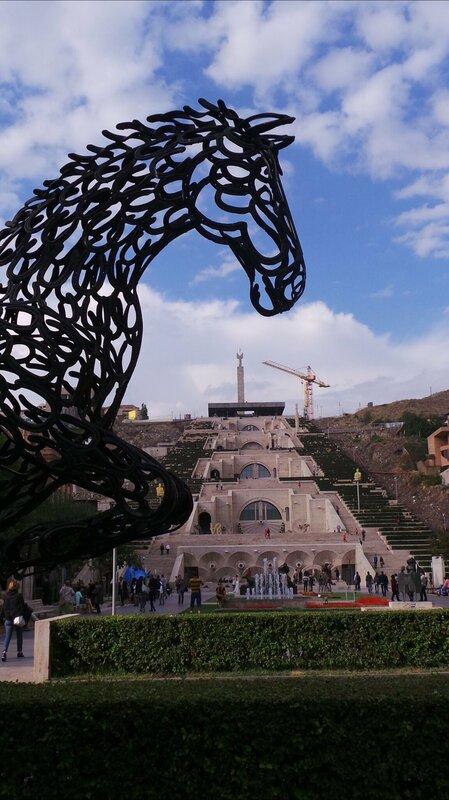 Tbilisi is full of life, there were lots of tourists and we went on a free walking tour which was great, wandered over the Bridge of Peace and got the Funicular to Narikala Hill and the Karlis Deda (statue) which has great views of the city. At night there are plenty of places to go, great restaurants and even nightclubs if you want to party. From Tbilisi we flew to Yerevan, Armenia where we stayed at the Hotel Tigran Mets which was in the centre of the city and close to Republic Square. Totally different feel to Yerevan as we were there during the days before Independence Day so there was lots of army personnel preparing for the celebration. Lots of old style Soviet era rockets and tanks on the roads, we had no idea what was going on until we found out there was a celebration coming up. Republic Square is quite nice to wander around and you can walk to the Cascade (stairway) which has lots of modern art. There is also a great street market where you can buy antiques, old army clothes and paintings amongst other things. 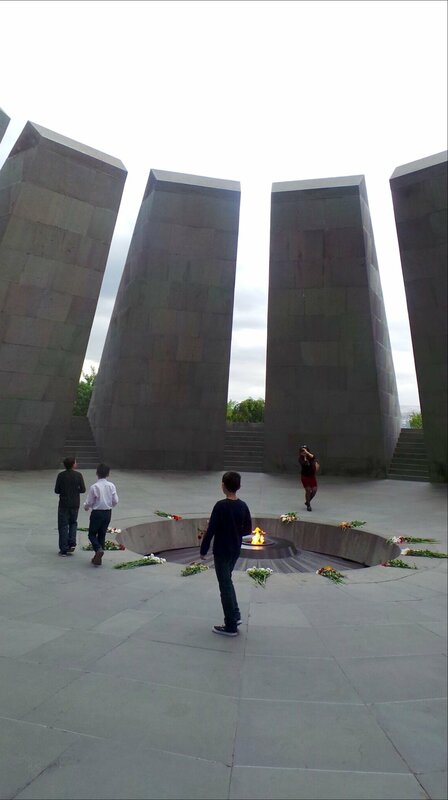 We visited the Genocide Museum and Monument where we saw lots of school children arrive and lay flowers, was quite moving to see. So our return flight to Tbilisi was cancelled so the hotel assisted us in getting a taxi driver to take us there instead. Seems to be totally normal to drive between the two countries so wasn't expensive. Our driver was brilliant and we stopped at a farm shop where he bought us huge loaves of bread and cheese to make our own sandwiches. Actually enjoyed our taxi back to Tbilisi as could see the countryside and get more of a feel for Armenia as we had only had time to visit Yerevan. Stayed overnight at a different area of Tbilisi at the bathhouses in the Old Tiflis Boutique Hotel and treated ourselves to a suite which had its own terrace and view which was a great place for us to relax and have glass of the local wine. Was a great area for exploring and again there are lots of restaurants in this area and there is a lovely waterfall close by. From here we caught a taxi to Kazbegi (Stephantsminda). This was the highlight of our trip because it is just so beautiful, see the cover picture! 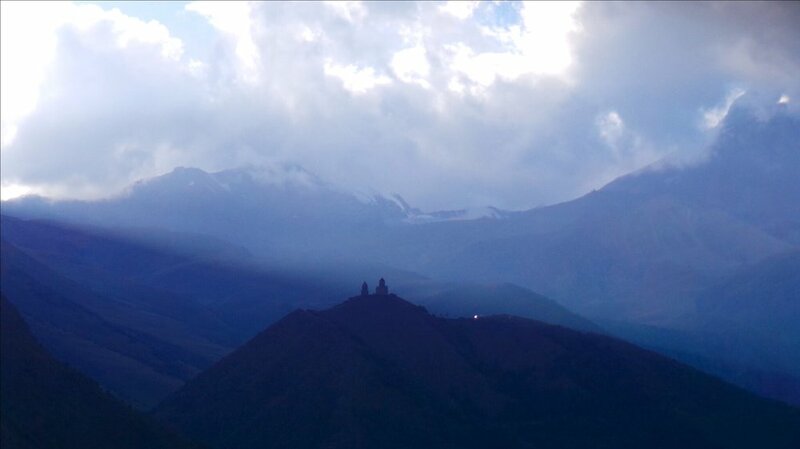 The taxi journey covers spectacular scenery, our driver stopped en route where people paraglide. We stayed in the Rooms Kazbegi hotel, which is a modern hotel high up with the best view of the Gergeti Trinity Church. It is a great base to be able to go trekking, with a spa/swimming pool and outside spaces. You can enjoy a drink on the decking outside with breathtaking scenery and watch how the shadows/sun changes the way it looks. It was hot during the day and freezing at night. The trek from the hotel to the Gergeti Trinity Church is definitely worth doing, arriving at the top and looking down on the hotel is amazing. Got a local driver to take us back to Tbilisi again which was rather fast on winding roads so didn't enjoy the way back as much as we enjoyed the way there! Had our last night in Tbilisi at the Citadel Narikala Hotel which is on such a steep hill that our driver refused to go up it. This trip was great fun and moving between the countries was fairly easy and we were not phased with the cancellation of our flight. We also decided to change hotels last minute and made decisions about what we wanted to do on the day. Totally recommend all three countries, they are all completely different and we only needed a pre-organized visa for Azerbaijan on a UK passport. So if you dare to do something different and would like to get a cultural hit from totally different countries, then this could be the trip for you!